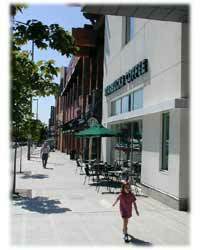 Are you planing on Moving to Bellevue or the Eastside? Contact our staff today to help you find a home in the area. View of Bellevue's Downtown from Bellevue Park. 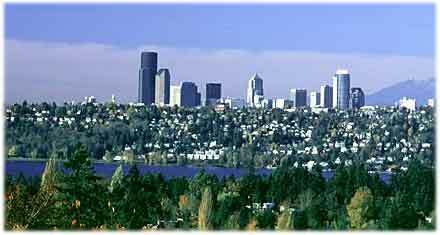 Located across Lake Washington from Seattle, Bellevue is the fastest growing city in King County. With a population of 112,344 in 2003, it's the fifth largest city in the state and largest on the Eastside. It also ranks 15th out of 522 Washington areas in affluence. Bellevue was founded in 1863 by William Meydenbauer. In 1963, the Evergreen Point Bridge was opened, which is now part of Highway 520, opening a second gateway to the city of Seattle. This led to rapid growth in the city, making Bellevue one of the largest cities in the State. Bellevue now boasts an impressive commercial and financial district, along with a collection of malls known as the Bellevue Collection. This includes Bellevue Square, one of the largest malls in the region, the new and impressive Lincoln Square, and Bellevue Place. Bellevue also claims many large businesses as their headquarters. Microsoft resides in the town next door, the infamous Redmond, and thus many of its children, that is, companies started by ex-Microsoft employees, reside in Bellevue. It also makes an attractive place for any of MS’s business partners to reside. Some of the most well known companies residing in Bellevue include T-Mobile, Expedia.Com, Paccar, InfoSpace and Eddie Bauer, with headquarters in Lincoln Square. This plethora of business has resulted in the Lake Washington "Gold Coast" district, including Hunts Point, Clyde Hill, Yarrow Point and more notably Medina, home to none other than Bill G himself.